Puree, Pulp, Juice Concentrate, IQF are among the most renowned processed form of mangoes. 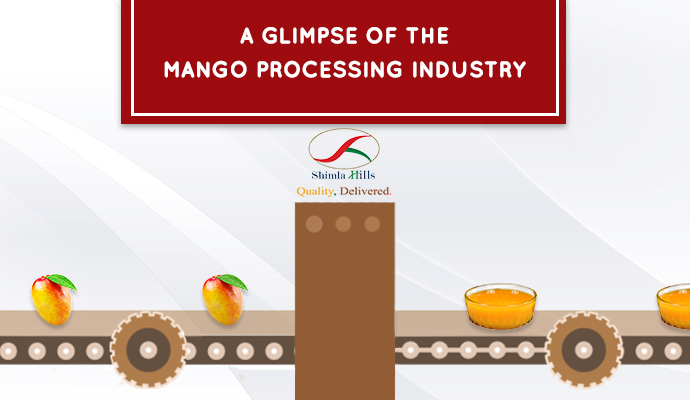 Let’s catch a peek of the mango processing industry. Mango Processing is a process wherein handpicked mangoes are inspected, washed, blanched, pulped, deseeded and turned into altogether a different form. The processing preserves mangoes in different forms which can be utilized even after summer. It is a source of additional income for mango growers. Though most of the players include only fresh mangoes in processing but deformed and rejected mangoes too can be incorporated and turned into a different form. Thus, the mango processing allows the consumption of the rejects in their different form for a longer period of time. IQF (Individual Quick Frozen) technique makes the mango dices and slices very easy to work with. It also preserves the nutrition value of the fruit. Mango Pulp, Puree, Juice Concentrate, etc. are one of the major ingredients that go in the making of numerous delicacies. Some of these products are mango juice, nectars, mango based drinks, jams, fruit cheese, mango ice-cream, dessert, puddings, bakery fillings, baby foods, flavors, yogurt and confectionery. In 2005, the Philippines exported a total of P13.3 million metric tons of processed mango products. India contributes nearly 46% of the total world production of mangoes that are further processed into various forms. In India Mango Production increased from 8.7 million tons to a whopping 13.8 million tons during 1991-2007. Mango puree constitutes more than 50% of the exported processed mango products. The country has exported 1,54,820.69 MT of Mango Pulp to the world for the worth of Rs. 841.39 crores during the year 2014-15. Shimla Hills exports mango processed products such as fruit pulp, juice concentrate, IQF and fruit puree that are healthy and made out of premium quality fully ripened fruits. They are processed under the extreme hygienic condition and then packed aseptically to retain 100% freshness, color, aroma, and flavor.